It is a difficult task to scare a person in a video game. After all, how scary can a mutant creature be when you have a combat shotgun waiting to greet it. A fully automatic assault rifle makes even the scariest things seem a little less frightening. Grenades help too. Generally the best a video game can do is startle you. Things jump out and scream at you before you shoot them 30 times. The medium is one that gives you total control over your environment, and so it is hard to feel any real fear for your gun-toting avatar. But that doesn’t mean the game can’t be creepy and unsettling, which is where F.E.A.R. 3 shines. 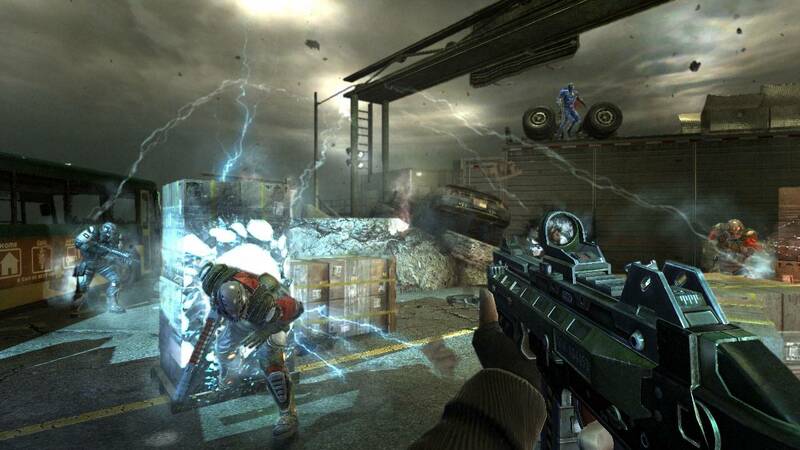 When you first start the game, it appears to be a typical first-person shooter using controls familiar to the millions that play Call of Duty. And with a FPS genre that is quickly approaching oversaturation, to have a shooter that is like all the others just with a new name and setting isn’t enough. You need something unique to make your game stand above the crowd. There is only so much shelf space for games where you shoot aliens or terrorists–each type of FPS could have its own sub-genre at this point. F3 has two things that help it to excel. The first is the uber-creepy setting, which is highlighted by exceptional audio that helps to sell some of the weirder things you will experience. The second is a multiplayer that presents something fresh and different, not to mention fun. Otherwise F3 is a fairly typical shooter, but it is a good one despite a few blemishes. 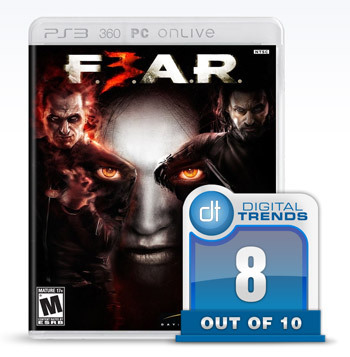 It won’t win over fans that didn’t like the previous F.E.A.R. games, but it does more than enough to keep the franchise alive and relevant. The story is almost extraneous to the game—it is all about the setting. F.E.A.R. 3 picks up several months after the events of F.E.A.R. 2, with the creepy woman/girl Alma preggers and getting ever more powerful. 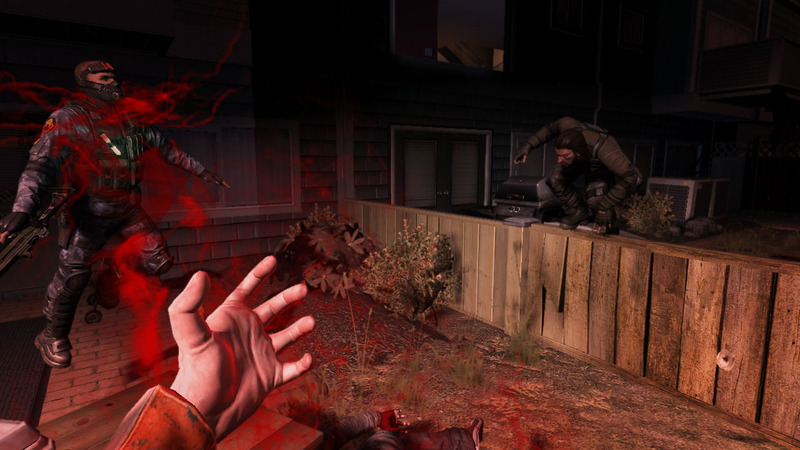 The protagonist of the first game, Point Man, returns after shooting his brother, Paxton Fettel, in the head and apparently killing Alma. But anyone that has watched a horror movie knows that once you kill a bad guy, unless you see their body (and burn it and maybe even shoot the ashes into space) they aren’t really dead. The group responsible for making Alma what she is, Armacham Security, has taken Point Man captive to interrogate him. This was a mistake, and one that you make them pay for when you first take control. Joining Point Man is the specter of his brother, Fettel who decided that death didn’t suit him. The psychic bond the two of you share thanks to your mother Alma bonds Fettel to Point Man, and the two go off to have wacky (and bloody) adventures. Together the one and a half brothers head out to find Alma and stop her pregnancy before she gives birth to something potentially horrible. The story is secondary, and most of the time you will only have a vague concept of where you are going or why. Each chapter begins with relevant information boiled down into two sentences, then a brief cutscene follows, and that’s your plot. Basically you are a big scary guy jumping into the middle of a big scary area that is slightly haunted. But what sets F3 apart is the little twists and surprises. Wandering through a rundown prison is not all that original for either a survival horror game, or a FPS title in general, but when you hear the sound of something growling that you never see, then things get interesting. You make your way through a series of early levels that would not be out of place in any FPS, but the deeper you get, and the closer you are to Alma, the more messed up the game becomes. It is never scary, but it does become a bit nerve-wracking and twisted as the game progresses. In that if differentiates itself admirably from many other FPS titles. While the gameplay to F3 is very similar to other FPS games, it moves differently than most. In Call of Duty, taking cover and choosing your shots is the way to go. In F3, that will eventually get you killed. The enemies in F3 are tough—like, three shotgun blasts from point blank range directly to the head tough–so you can slowly and methodically try to pick off enemies if you like, but it will take time. And that is always assuming you don’t take a grenade, or your cover doesn’t get shot away. The enemy AI isn’t the brightest in the world, but it isn’t bad either. If you are hiding behind cover, the enemies will throw grenades, and lots of them, with an accuracy that you will never be able to match (the grenade throwing mechanic is deeply flawed). But hiding behind cover isn’t how you should play. The controls are standard enough, with the exception of the slo-mo button, which gives Point Man a massive advantage. Paired with his sprint and jumping abilities, you can wade into enemies and kill three or four before they have time to look at you, then head for cover to reload. This game encourage the Leroy Jenkins in us all, and running out and attacking, and generally being aggressive is the way to go. In fact, the more you camp, the more enemies you will need to fight. But once you get a rhythm down, and once you can mix in all the powers at your disposal, it is a lot of fun to tear enemies up. You can’t always get away with it, but you usually can. One thing that truly sets F3 apart is the co-op options. More than just letting two players play at once, F3 allows one player to take control of Point Man, and the other to take Fettel. Fettel moves and acts totally different than Point Man, and offers a different experience. Fettel is a specter, so his powers are slanted that way. He can’t hold a weapon, but he can lift people in the air from a distance, shoot psychic fireballs, and possess enemies. Of all his powers, the possession offers the most interesting options. You can run into a room, suspend an enemy and make them explode with a melee attack (which is kinda awesome), turn to throw a fireball, then possess an enemy on the opposite side of the room. When you do, you the game becomes a normal shooter and you can let the possessed take damage while emptying clips into enemies before retreating. Fettel can turn a room into utter chaos in under a minute. When you have Fettel and Point Man together, you can wreak armies. Once you complete a level as Point Man during the solo campaign, you can then go back and play the level as Fettel. The game also has two endings based on who you play as, or in co-op whichever character has accrued more points will determine the closing scene. With split screen or online co-op, and each level available to play through as a different character on solo, you have to give it to F3 for the replay value, even though you can beat the game in 8 -10 hours if you meander–five if you know where you are going. If it were just the campaign, F3 would be a decent, but forgettable FPS. It would be fun to play, but once people beat it as Point Man and again as Fettel, they would probably never pick it up again. Thankfully, the multiplayer is there to add another layer to the game. F3’s multiplayer is not the typical competitive multiplayer. There is no deathmatch, and you won’t be capturing flags. There are four game types, each with a four player max, and each with particular objectives: Soul King, Soul Survivor, F*@king Run and Contractions. Soul King is a competitive map where players begin as ghosts and must possess AI soldiers in order to kill other enemies and collect the most souls, Soul Survivor has three players up against one human-controlled specter who can turn the other players into specters to join them, and F*@king Run has four players working together to survive waves of enemies as Alma’s Wall of Death closes in on them. But of the four, Contractions is the one that most will gravitate towards, and players that have played Call of Duty’s Zombie mode will be right at home. Four players all defend a location from waves of enemies, and between each round, they can run out to grab supplies which will allow them to take new weapons from the armory. Players will fight through 20 rounds as a fog creeps ever closer and limits the area, and Alma wanders the battlefield, killing anyone that is unlucky enough to catch her gaze. All four are a fun change of pace from the normal online shooters out there. The multiplayer is original and fresh, and fans of CoD’s zombie should love it. Whether or not it is enough to create a community remains to be seen, but even if it can’t you should be able to get enough games in, and get enough out of it to make F3 worth the price. When it comes to the play controls, graphics and plot, F.E.A.R. 3 is nothing special. 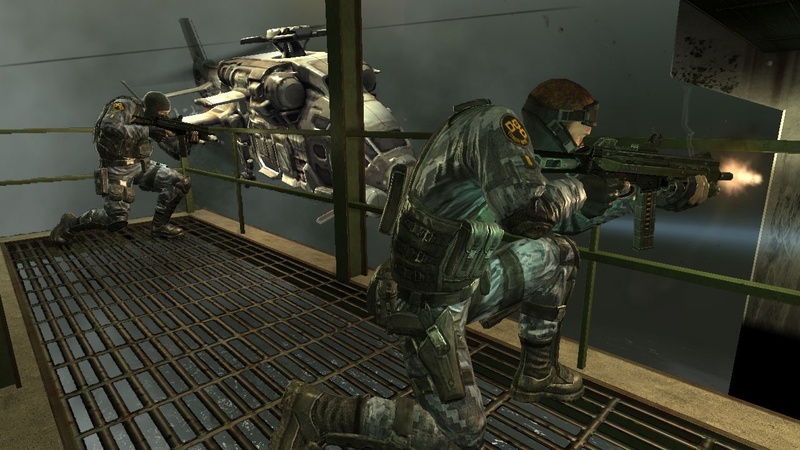 But great moments sprinkled through a suitably creepy campaign, the ability to play through as another character, and the multiplayer and co-op options make F.E.A.R. 3 far more than just the average game that it may appear to be at first glance. So if you are looking for a FPS with a twist, a survival horror game that will get under your skin or a somewhat original multiplayer experience, then look no further.